Vilnius is Lithuania's capital and has more than its share of historic sites, museums and architectural treasures. It has a lot to offer in terms of arts, entertainment and nightlife venues. With good services in Vilnius, world-class hotels and restaurants, you will find just about everything you need to feel safe and comfortable. I fell in love with the city since my first visit a few years ago. Its history, somewhat unpretentious elegance, laid back atmosphere and hospitable attitude of the locals make it a very likeable and memorable city. The city is beautiful and easy to explore – it is endowed with green parks and gardens, cosy squares and fountains, and bridges spanning across the River Neris. It is a rather compact city and a lot of places of interest are easy to get to on foot. The major attractions are concentrated in the Old Town and the City Centre. There you will find Vilnius Cathedral and Gediminas Castle, which are among the main symbols of the city. The historic Old Town is undoubtedly the most beautiful and most enchanting part of the city. I also found it a very homely place. The Old Town retains a lot of colour and spirit of its medieval past. I loved its historic buildings painted mostly in pastel yellow and pink colours. therefore it has a blend of architecture, which makes it a truly rewarding place for photography lovers and painters. When having Vilnius vacations my favourite pastime was wandering among the winding cobblestone streets with Lija and come across a cosy café tucked away in some secluded courtyard. The city's dining scene really appeals to me. At nearly every corner you see an attractive restaurant or café, which are usually atmospheric inside and the food quality is good in most of them. Outdoor seating is very popular in the summer. Overall I found that especially in the warm season the Lithuanians love to spend as much time as possible outdoors strolling along the Old Town streets. Most of them are welcoming and friendly to foreigners. The city gets especially bohemian and vibrant during festivals , fairs and other celebrations. 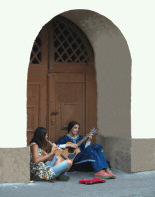 A dynamic mix of music, street performances and visual arts flow through the streets of the city. The city is the heart of arts and culture of Lithuania where you will find ballet, classical music concerts, opera and Vilnius jazz festival. Performances are known for their high quality and available at low prices. It is well worth mentioning that in 2009 Vilnius will be European Capital of Culture. The city will be decorated and many cultural events will take place on that occasion. Well, when the night falls, the city is a much happening place. And for those who are planning a weekend city break only for exploring its nightlife , there is a number of stylish bars and trendy clubs to choose from. Most of them are located not far from each other so you can easily walk from one venue to another. With the help of Lija I explored other districts of the city, which might not be so well known to the visitor as the Old Town. I found Bohemian Uzupis very charming. It is most remarkable for its pretty historical buildings, artists’ workshops and non-mainstream art. Being a cosmopolitan European city, it has a modern side to it as well. The city is one of the largest financial centres in the Baltic States. which is a commercial and residential modern district with skyscrapers and large modern shopping centres. a city weekend break in Vilnius, or an extended stay.